Rioplatense Spanish, Italian and Italian dialects. Italian Argentines (Italian: italo-argentini, Spanish: ítalo-argentinos) are Argentine-born citizens of Italian descent or Italian-born people who reside in Argentina. Italian immigration is one of the largest and central ethnic origins of modern Argentinians, together with Spanish immigration as well as the colonial population that settled previously to the major migratory movements into Argentina. It is estimated up to 25 million Argentines have some degree of Italian descent (up to 62.5% of the total population). Italians began arriving in Argentina in great numbers from 1857 to 1940, totaling 44.9% of the entire post-colonial immigrant population; more than from any other country (including Spain at 31.5%). In 1996, the population of Argentines with partial or full Italian descent numbered 15.8 million when Argentina’s population was approximately 34.5 million, meaning they consisted of 45.5% of the population. Today, the country has 25 million Italian Argentines in a total population of 40 million. Italian settlement in Argentina, along with Spanish settlement, formed the backbone of today's Argentine society. Argentine culture has significant connections to Italian culture in terms of language, customs and traditions. Small groups of Italians started to immigrate to Argentina as early as the second half of the 18th century. However, the stream of Italian immigration to Argentina became a mass phenomenon only in the years 1880–1920 during the Great European immigration wave to Argentina, peaking between 1900–1914; about 2 million settled between 1880–1920, and just 1 million between 1900–1914. In 1914, the city of Buenos Aires alone had more than 300,000 Italian-born inhabitants, representing 25% of the total population. The Italian immigrants were primarily male, aged between 14 and 50 and more than 50% literate; in terms of occupations, 78.7% in the active population were agricultural workers or unskilled laborers, 10.7% artisans, while only 3.7% worked in commerce or as professionals. The outbreak of World War I and the rise of Fascism in Italy caused a rapid fall in immigration to Argentina, with a slight revival in 1923–1927, but eventually stopped during the Great Depression and the Second World War. After the end of World War II, Italy was reduced to rubble and occupied by foreign armies. The period 1946–1957 brought another massive wave of 380,000 Italians to Argentina. The substantial recovery allowed by the Italian economic miracle of the 1950s and 1960s eventually caused the era of Italian diaspora abroad to finish, and in the following decades Italy became a migration receiving country. Today, there are still 527,570 Italian citizens living in the Argentine Republic. In the decades before 1900, Italian immigrants initially arrived mainly from the northern regions of Piedmont, Veneto and Lombardy; after the turn of the century and the unification of Italy and the establishment of the North as the dominant region of the Unified Italy, immigration patterns shifted to rural and former independent Southern Italy, especially Campania, Calabria and Sicily. In Argentine slang, tano (from Napulitano, "Neapolitan") is still used for all people of Italian descent where it originally means inhabitant of the former independent state the Kingdom of Naples. . The assumption that emigration from cities was negligible has an important exception, and that is the city of Naples. The city went from being the capital of its own kingdom in 1860 to being just another large city in Italy. The loss of bureaucratic jobs and the subsequently declining financial situation led to high unemployment. In the early 1880s epidemics of cholera also struck the city, causing many people to leave. According to a study in 1990, considering the high proportion of returnees, a positive or negative correlation between region of origin and of destination can be proposed. Southern Italians indicate a more permanent settlement. The authors conclude that the Argentinian society in its Italian component is the result of Southern rather than Northern influences. Manuel Belgrano, Italian-Argentine politician and military leader who created the Flag of Argentina. According to Ethnologue, Argentina has more than 1,500,000 Italian speakers, making it the third most spoken language in the nation (after Spanish and English). In spite of the great many Italian immigrants, the Italian language never truly took hold in Argentina, in part because at the time, the great majority of Italians spoke specifically their regional languages and not many the national standard Italian language. This prevented any expansion of the use of the Italian language as a primary language in Argentina. The similarity of the Italian dialects with Spanish also enabled the immigrants to assimilate, by using the Spanish language, with relative ease. Italian immigration from the second half of the 19th century to the beginning of the 20th century made a lasting and significant impact on the intonation of Argentina's vernacular Spanish. Preliminary research has shown that Rioplatense Spanish, particularly the speech of the city of Buenos Aires, has intonation patterns that resemble those of Italian dialects (especially Neapolitan) and differ markedly from the patterns of other forms of Spanish. That correlates well with immigration patterns as Argentina, and particularly Buenos Aires, had huge numbers of Italian settlers since the 19th century. 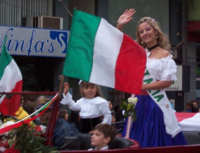 According to a study conducted by National Scientific and Technical Research Council of Argentina, and published in Bilingualism: Language and Cognition (ISSN 1366-7289)The researchers note that this is a relatively recent phenomenon, starting in the beginning of the 20th century with the main wave of Southern Italian immigration. Before that, the porteño accent was more similar to that of Spain, particularly Andalusia. Much of Lunfardo arrived with European immigrants, such as Italians, Spanish, Greek, Portuguese, and Poles. It should be noted that most Italian and Spanish immigrants spoke their regional languages and dialects and not standard Italian or Spanish; other words arrived from the pampa by means of the gauchos; a small number originated in Argentina's native population. Most sources believe that Lunfardo originated in jails, as a prisoner-only argot. Circa 1900, the word lunfardo itself (originally a deformation of lombardo in several Italian dialects) was used to mean "outlaw". Lunfardo words are inserted in the normal flow of Rioplatense Spanish sentences. Thus, a Spanish-speaking Mexican reading tango lyrics will need, at most, the translation of a discrete set of words, and not a grammar guide. Tango lyrics use lunfardo sparsely, but some songs (such as El Ciruja, or most lyrics by Celedonio Flores) employ lunfardo heavily. "Milonga Lunfarda" by Edmundo Rivero is an instructive and entertaining primer on lunfardo usage. Between about 1880 and 1900, Argentina received a large number of peasants from the South of Italy, who arrived with little or no schooling in the Spanish language. As those immigrants strove to communicate with the local criollos, they produced a variable mixture of Spanish with Italian languages and dialects, specially Neapolitan. This pidgin language was given the derogatory name cocoliche by the locals. Since the children of the immigrants grew up speaking Spanish at school, work, and military service, Cocoliche remained confined mostly to the first generation immigrants, and slowly fell out of use. The pidgin has been depicted humorously in literary works and in the Argentine sainete theater, such as by Dario Vittori. "Milanesa a la napolitana" with French fries. Argentine cuisine has been strongly influenced by Italian cuisine; the typical Argentine diet is a variation on the Mediterranean diet. Italian staple dishes like pizza and pasta are common. Pasta is extremely common, either simple unadorned pasta with butter or oil, or accompanied by a tomato- or bechamel-based sauce. Pizza (locally pronounced pisa or pitsa), for example, has been wholly subsumed and in its Argentine form more closely resembles Italian calzones than it does its Italian ancestor. Typical or exclusively Argentine pizzas include pizza canchera, pizza rellena (stuffed pizza), pizza por metro (pizza by the meter), and pizza a la parrilla (grilled pizza). 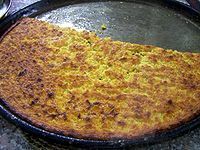 While Argentine pizza derives from Neapolitan cuisine, the Argentine fugaza/fugazza comes from the focaccia xeneise (Genoan), but in any case its preparation is different from its Italian counterpart, and the addition of cheese to make the dish (fugaza con queso or fugazzeta) started in Argentina or Uruguay. Fainá is a type of thin bread made with chickpea flour (adopted from northern Italy). The name comes from the Ligurian word for the Italian farinata. Pizzerias in Buenos Aires often offer fainá, which is eaten with pizza, a wedge of fainá on top of a wedge of pizza. Nevertheless, the pastas (pasta, always in the plural) surpass pizzas in consumption levels. Among them are tallarines (fettuccine), ravioles (ravioli), ñoquis (gnocchi), and canelones (cannelloni). For example, it is common for pasta to be eaten together with white bread ("French bread"), which is unusual in Italy. This can be explained by the low cost of bread and the fact that Argentine pastas tend to come together with a large amount of tuco sauce (Italian sugo), and accompanied by estofado (stew). Less commonly, pastas are eaten with a dressing of pesto, a green sauce based on basil, or salsa blanca (Béchamel sauce). Sorrentinos are also a local dish with a misleading name (they do not come from Sorrento, but were invented in Mar del Plata). They look like big round ravioles stuffed with mozzarella, cottage cheese and basil in tomato sauce. Polenta comes from Northern Italy and is very common throughout Argentina. And, just like polenta concia in Italy, it is eaten as a main dish, with sauce and melted cheese, or it may accompany a stew. Other dishes are milanesas (the name deriving from the original cotoletta alla milanese from Milan), breaded meats similar to the Wiener schnitzel. 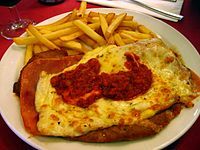 A common dish of this variety is the milanesa napolitana, an Argentine innovation despite its name, which comes from former Buenos Aires restaurant "Nápoli". It is breaded meat baked with a topping of melted cheese, tomatoes, and sometimes ham. The milanesa was brought to Argentina by Central European immigrants. Pasta frola is a typical Argentine recipe heavily influenced by Southern Italian cuisine, known as Pasta Frolla in Italy. Pasta frola consists of a buttery pastry base with a filling made of quince jam, sweet-potato jam or milk caramel (dulce de leche) and topped with thin strips of the same pastry, forming a squared pattern. It is an Argentine tradition to eat pastafrola with mate in the afternoon. The dish is also very popular in Paraguay and Uruguay. The traditional Italian recipe was not prepared with latticework as it is in Argentina, but with a lid pierced with molds in forms of heart or flowers. Ice cream (Spanish: Helado, Italian: gelato) is a particularly popular Argentine dessert. Its creamy texture is due to the large proportion of cream, and, as everywhere, many flavors are available. Ice cream was again a legacy of the Italian diaspora. 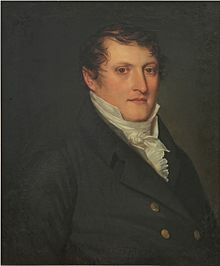 Manuel Alberti, priest and member of the Primera Junta in 1810. ^ a b c Departamento de Derecho y Ciencias Políticas de la Universidad Nacional de La Matanza (14 November 2011). "Historias de inmigrantes italianos en Argentina" (in Spanish). infouniversidades.siu.edu.ar. Se estima que en la actualidad, el 90% de la población argentina tiene alguna ascendencia europea y que al menos 25 millones están relacionados con algún inmigrante de Italia. ^ In 2005, the Servicio de Huellas Digitales Genéticas of the Universidad de Buenos Aires concluded an investigation directed by the Argentinean geneticist Daniel Corach. The study was done over genetic markers in a sample of 320 male subjects, taken at random of a group of 12 000 individuals from 9 provinces. ^ "Olimpiadas Nacionales de Contenidos Educativos en Internet – Instituto Nacional de Educación Tecnológica". Oni.escuelas.edu.ar. Retrieved 14 January 2018. ^ a b c d Baily, Samuel L. (1999). Immigrants in the Lands of Promise: Italians in Buenos Aires and New York City, 1870 to 1914. United States: Cornell University Press. p. 54. ISBN 0801488826. ^ Devoto, Fernando J. (2006). Historias de los Italianos en Argentina. Buenos Aires: Editorial Biblos. pp. 329–330. ISBN 978-950-786-551-0. ^ Mignone, Mario B. (2008). Italy today: facing the challenges of the new millennium. New York: Peter Lang Publishing. p. 213. ISBN 978-1-4331-0187-8. ^ "Ministero dell'Interno". Infoaire.interno.it. Retrieved 14 January 2018. ^ "Federaciones Regionales". Feditalia.org.ar. Retrieved 2010-04-25. ^ Cacopardo, MC; Moreno, JL. "Migration from Southern Italy to Argentina: Calabrians and Sicilians (1880–1930)". Studi Emigr. 27: 231–53. PMID 12342955. ^ "Argentina". Ethnologue. Retrieved 24 March 2015. ^ "Cambridge Journals Online – Bilingualism: Language and Cognition – Abstract – Convergence and intonation: historical evidence from Buenos Aires Spanish". Journals.cambridge.org. Retrieved 24 March 2015. ^ Colantoni, Laura; Gurlekian, Jorge. "Convergence and intonation: historical evidence from Buenos Aires Spanish". Bilingualism: Language and Cognition. ^ Gabriel Alfonsin. "Helado Artesanal : Asesoramiento y Cursos de fabricacion helado artesanal. Franquicias". Heladoartesanal.com. Retrieved 24 March 2015. ^ "SCUOLE PARITARIE ITALIANE ALL'ESTERO" (Archive). Ministry of Foreign Affairs (Italy). p. 2–3. Retrieved on November 20, 2015. "Immigrants Being Transported on Horse-Drawn Wagon, Buenos Aires, Argentina" is a photograph by Frank G. Carpenter. He talks about Italian Argentines in the site caption. This page was last edited on 15 April 2019, at 12:32 (UTC).